Live text & audio of second practice is live on the BBC Sport website from 18:30 BSTRed Bull's Max Verstappen pipped Lewis Hamilton's Mercedes in first practice at the Canadian Grand Prix.The Dutchman was 0.088 seconds quicker but was using softer, faster tyres.Hamilton was on the ultra-soft tyres as was team-mate Valtteri Bottas in fifth, ahead of Ferrari's Kimi Raikkonen. Fernando Alonso was impressive in seventh place for McLaren, just 0.598 seconds off the pace and on the same ultra-soft tyres as Mercedes were using. 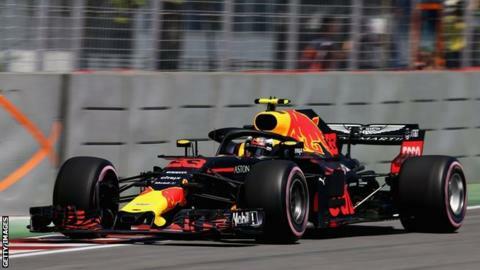 The Spaniard, celebrating his 300th grand prix this weekend, was fastest early on before a brief red-flag period when Nico Hulkenberg's Renault stopped on track with gearbox issues, and continued to appear close to the sharp end throughout the 90 minutes. Max Verstappen was fastest, just one day after suggesting he might "headbutt" somebody if he was continually asked about the mistakes he has made this yearHamilton is concerned about the fact that Mercedes are the only engine manufacturer who have not brought an upgrade to Canada, where engine power is more important in overall lap time than at many other tracks.Mercedes found a "quality issue" with their upgraded engine, believed to be a tolerance that would have made the engine unlikely to last the seven races engines need to run this season.It is now slated for introduction at the next race in France, but Ferrari, Renault and Honda all have upgrades in Canada. Hamilton has said women are not being paid enough in sport after he was classified as the 12th richest sportsperson in the Forbes 100 listHamilton is concerned that doing this race with an old engine that will have lost a small amount of power over its life could be enough to make it difficult to contend for victory at a track where he has won six times in 10 races.Hamilton leads Vettel by 14 points in the championship heading into the weekend, with Ricciardo third, 38 points off the lead.Canada is a tricky track where mistakes are often plentiful because of the proximity of concrete walls to fast and demanding chicanes.But although there were a number of wobbles from drivers, only the two Williams drivers actually hit the wall.Lance Stroll suffered a puncture when he brushed the 'wall of champions' at the final chicane and team-mate Sergey Sirotkin spun and touched the wall at Turn Seven late in the session.The Williams looked a handful out on track, as ever, and Sirotkin finished the session 17th, 0.491secs ahead of Stroll in 18th.Only Force India reserve Nicolas Latifi, in his first F1 practice session, and Hulkenberg, who did not set a time, were behind the Williams on the time sheets.